For low to moderate crime areas the Kryptonite Kryptoflex 1018 combo lock is perfect - especially in addition to your main D or U-lock system. It adds a secondary deterrent to would-be thieves, and is especially useful for securing any quick release feature such as wheels. 10mm braided steel cable is dense and strong for added cut resistance. At 180cm long, the cable is long enough to attach 2 bikes together if you wish. The Kryptoflex 1018 uses a 4 digit combination locking mechanism meaning you don't have to carry around extra keys. 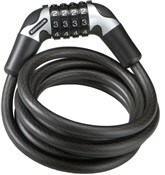 Bought this as a secondary lock to use whilst my bike is parked up at work and nipping to the shops. When the D-lock isn’t needed. Good little additional lock. Compact & versatile. Perfect for secondary locking in the garage for storage or when nipping to the shop (pub!!) for some milk!! Great service from tredz..... Even got some Haribo's in the package! !